Re - visited the pub this week. Different selection of ales and a different day time barman, but this one also knew his stuff. Still as good as ever! Was staying in the area and only pooped in for a quick pint on the first evening - ended up going in every day for 'early doors'. Was so impressed thast I didn't bother going in any of the other local pubs.I believe this pub changed hands in May 2011 so can't comment about it before, but I received excellent service, enjoyed good quality beer and good food, both at realistic prices. Was particularly impressed with the vitality of the bar and waiting staff, and one of the lads behind the bar really knew his beers, and was recommending other local brews to me. The decor is unpretentious basic - reminded me of the pubs of my youth in the '70's, but immacultely clean and no juke box or fruit machine. 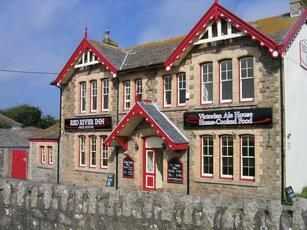 A great pub visited for the first time on Sunday. I had done some research before hand as I wanted a decent ale pub that was dog friendly as I was arranging to cycle there to meet my parents with their dog. All I can say is I chose well! The staff were very friendly, a decent selection of ales on offer of which I had the Skinners royal wedding and the Otter - both the beers were in perfect condition. Due to the sunny weather the beer garden was most welcome. Didn't eat as but the Sunday roasts being served looked very good and people eating them were leaving clean plates. I will definitely come back next time I come down to visit the parents. Nice range of beers and a clean well kept bar. Although we didn't eat there, the food looked excellent and most people commented on how good it was. The decoration and furniture is very basic, with bare painted walls and wooden flooring, looking like an old schoolroom. The landlord, whilst quite pleasant and welcoming at first, gave the distinct impression that it was a chore to have to be there, and couldn't wait for closing time, telling everyone how many long hours he worked every day and how it was 2.30pm closing and indeed, he had everyone out and the inn shut and locked by that time. Perhaps it was his broken wrist and bad foot that made him a bit crabby..... or perhaps just caught him on an off day, which was a shame as it somewhat spoilt the visit. However, I hope he recovers soon as this could be a first class pub.